I don’t quite remember which book that was on the cover of at this point (though surely it was one of the crappy De Camp “collaborations” from the 70s), but the image is burned into my head. So long, Frank. You’ll be missed every time I pick up a pie from Conan’s Pizza. This entry was posted in General Geekness on May 10, 2010 by the venomous pao. Great bit of Frazetta art there too. One question – why is that pizza place called Conan’s Pizza? I notice they do a “Savage pizza” – is there like a Hyborian theme at this place or what? Definitely a sad bit of news. And glad you like the pic I chose. It really is my favorite. 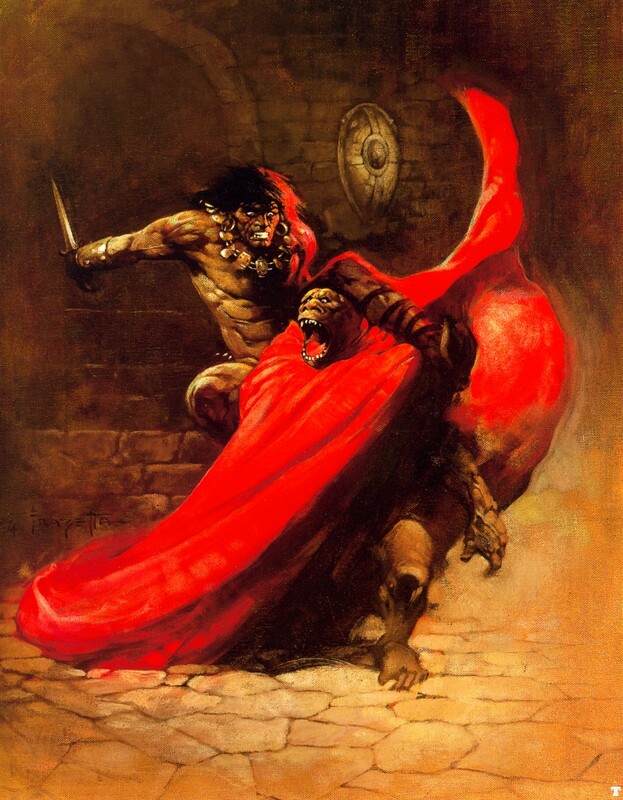 As to the pizza place, the walls of Conan’s (well, at least two locations, I’ve never ventured as far into the southern hinterlands as the third) are covered in Frazetta & Vallejo art. Scroll down to the bottom of these pages to see a few pics. Pay specific attention to the pieces painted on the mirrors at the “north” location. Nice homage. That picture is from the first Lancer Conan collection with the pastiches by L. SPrague DeCamp and Lin Carter. Conan takes down Thak. Thanks for clearing that up, bat! I figured it had to be representative of Rogues in the House, but for the life of me I couldn’t remember which book/edition it was the cover for. Leave it to you to solve the puzzle. You’re a good man, amigo! Rogues in the house is one of the better rewrites done after howard’sdeath, I think. But whatever the book- it’s a great bit of art. I love the conan themed pizza shop! That’s great! And I’m delighted to share Conan’s Pizza with the world. Even if you’ll probably never wind up there, it’s a good thing to know about. And, frankly, it’s pretty good pizza, too. I just avoid the deep dish ‘cos I’m a New York style pizza kinda guy. Despite my handicap of being raised in Dallas I know good pizza. A family from Brooklyn had relocated to town before I was born and set up a pizzeria that my family frequented. Consequently, I didn’t know what bad pizza was until I was 7 or 8 and a friend’s mom order us stuff from Pizza Hut one afternoon when I was visiting. This has actually spured on a column for me – I’ve recently taken up the music writer mantle at my paper after years as a cops and court journalist – but somehow I’ve also been dumped with writing about food for a few months while the regular journo gets married. All this talk of Conan Pizza has made me knock out a food column on those special places you ended up in as a kid – the pizza parlour, a burger joint or a milkbar – and the effects they had on you. Totally inspired by your comments and best of all, I get to drag Conan and Mr Frazetta into the column. hit up the dude, APN, running it and get involved – bloody lot of fun. I’m playing a browned skinned, cobra quick sellsword named Mufasa. Cool idea for a column, Goblinkin! Slide me a link if it’s available online. I’d love to read it! 1) I’m absolutely terrible at PBP stuff. I get all excited and really want to do it and then I get distracted and turn into the jerk who never posts. And I don’t want to be that guy – especially in a game that seems to be going very well. 2) The color scheme of the BoL blog site tears my eyes out, stomps on them, and then calls me names that make me cry. I’ve tried to select a different theme and it never seems to work – so either it can’t be done or else I’m an idiot. Either way, the thought of being involved in something that active there makes my brain beg for mercy. And I was still wrong, those are the Ace books. I could have walked five feet to verify that, but oh no, not me! I just had to rattle the wrong publishing house. But these are the books with the pastiches alongside the R.E.Howard stories. Oh, it’s worth being excited over.